CBH2B, CEA-CBH2W, R2PPC viewed from wire end of plug--like looking into jack on back of radio. Tech Tip: SCAN-2P-AC AC powercord fits Grundig 2440; also many boomboxes & portatble tape recorders having a 2474J style 2 pin AC power jack with contacts for automatic change-over from DC to AC power when the AC power cord is plugged in. CEA-CRST-AC fits AC pins of Sears-6 connector: CM2358S, 934.38270700, JC Penney -6241, Realistic TRC46, TRC455 etc. 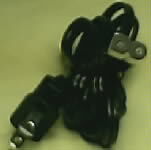 Mini-Molex male pins have contact diameter of .062" and fit into a .065" hole in the connector housing. Molex male pins have contact diameter of .093" and fit into a .125" hole in the connector housing. Revised May 2016; 2007 kt; Copyright © 1997, 2000 Paraland, All Rights Reserved.